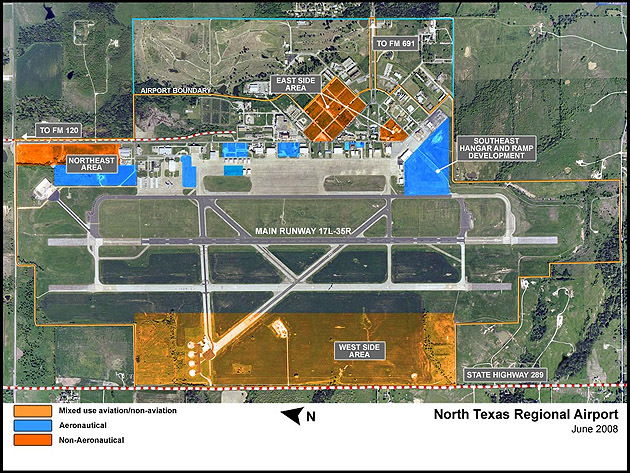 North Texas Regional Airport is owned by Grayson County, allowing for a faster, more streamlined development process with fewer regulations to slow your business down. The airport is exceptionally well constructed. A former Air Force base, the runways are stressed to heavy capacities and the utilities are robust. Many hangars have been replaced or refurbished. Both cable and fiber optic services are available. Recently completed above ground drainage improvements make North Texas Regional Airport a pleasant place to work even in inclement weather. Immediately adjacent to tarmac contingent properties are industrial sites, dormitories, golf course and other services. There is a new terminal building expansion being planned.